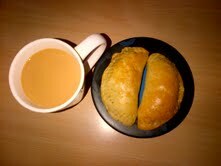 I'm not that much of a baker, but I decided to bake today and voila, it turned out really well. It was bound to be another boring saturday as Six Nations Rugby was on tv and my better was full of lergies. 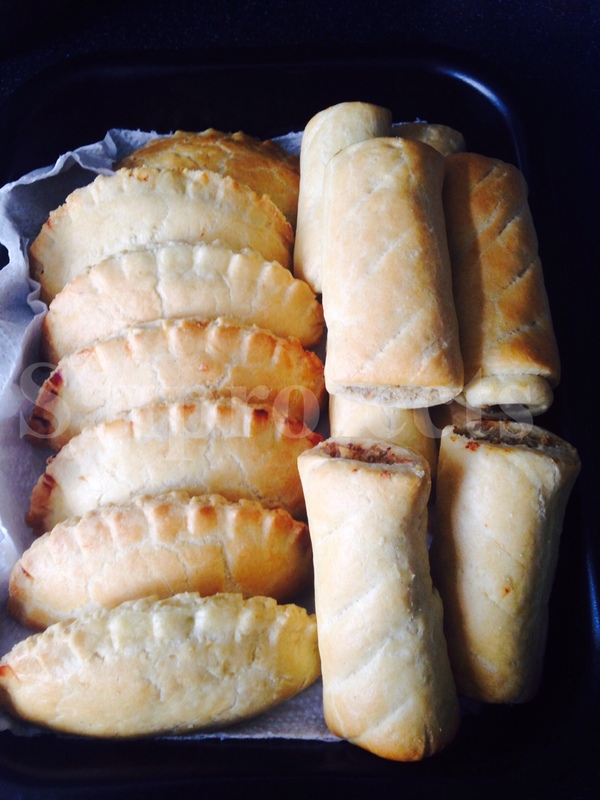 I decided to do something exciting by baking Nigerian Meatpie. Add the oilve oil in a pot, leave to heat up for 2 minutes, add onions and leave to fry for 1 minute. 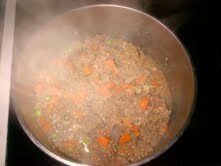 Add the mince, carrots, peas, scotch bonnet and diced potatoes. Add the stock cubes and thyme and leave to cook until brown for 5 to 7 minutes and leave on the side to cool. Glaze your baking dish with some butter and leave aside. Add the flour in a bowl, add the baking powder and salt and use fingers to mix thoroughly until it becomes crumbly. Add the butter and water, mix well until thick and in a ball form. Once thick, roll wth a dough roller and section with a dough cutter or bowl to make round cuts on the rolled out dough. Scoop in the mince in the center of the round cuts making sure the quantity of the mince does not overflow. Close the dough, and use a fork to press the two edges together to close tightly; place in the baking dish. 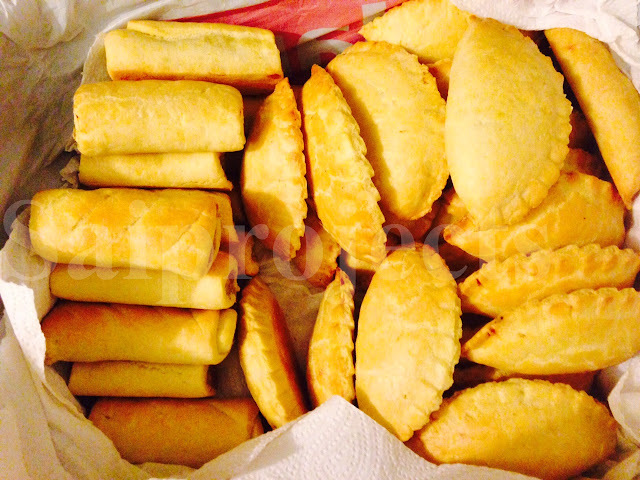 Break the egg in a bowl, whisk and glaze the top and ends of the pies with a glazing brush; this is to ensure that the meatpie is perfectly sealed preventing it from opening whilst baking. My Ex-boyfriend left me and my daughter since 6 weeks ago after, I tried ALMOST EVERYTHING to restore my relationship and I was disappointed. None was working out, A week later I saw Dr. Sam website and after I contact Dr. Sam for help, everything automatically change, my sadness became joy, smile was all over my face, everything happened very FAST and the result was effective. Dr Sam is the ONLY spell caster who i had success with, my boyfriend called me and said she wanted us to come back and also want to marry me. She came back to me begging me to accept her back and this happened Due to the help of Dr. Sam. I Am so happy that I have my boyfriend back. Contact Dr. Sam now for an urgent and fast love spell to win your relationship back. I am Shelly Maggie, Just some few days ago, My life seemed to be going down the drain, I was going to lose my Husband, my house and car to the mortgage company and insurance company....I ran around helplessly looking for a solution on how to get my Husband back and secure my bills, tried every single spell worker that I could find on the internet but got no results Until a friend told me about this great spell caster called Dr Ozil.. I decided to give him a try and that was when I finally found true happiness and result.. He has magical spells and voodoos for what whatever situation you find yourself. I am a living testimony to this and its so obvious that I can keep my mouth shot, I was stunned and found this unbelievable, Now I have my husband back and can handle all my financial crisis.. I really hope he doesn't mind me advertising his contact on the Internet but I'm sure any help extra work will benefit him. You can view his website: http://drozilsolutionhome.website2.me/ contact him via email: drozilsolutionhome@yahoo.com or drozilsolutionhome@outlook.com or call/whatsapp +2348161897826 Hope this helps everyone that is in need of any help...You can get the bellow problems solve here. I'm Olivia Megan from United State,I'm happy that my husband is back into my life after 2 years of divorce, Dr.Davi brought my husband back today and i am so excited. I got Dr.Davi email online when a lady was testifying about the strong spell caster who restored her marriage then I said to myself since he helped her, he can also help me,so i emailed him and told him the pain that I was going through,and he told me what to do and i did it,Then he did an urgent Love spell for me. 48 hours later, my husband came back home and with lots of love and joy,and he apologized for his mistake,and for the pain he caused me. Then from that day,our marriage was now stronger than how it were before, All thanks to Dr.Davi. Our family is complete again. If you are going through Divorce/Broke-up since Dr.Davi helped me, he can also help you..email him at: Spelltemple@fastmail.com,Thank you Dr Davi for saving my broken Marriage and brought my husband back to me. My testimony on how i won lottery with Dr. Davi magic lottery winning numbers: If you are out there looking for a good spell caster to win lottery,search no more Dr. Davi is the right contact you need and i assure you that you will also win and be happy like me. I'm Olivia Megan from United State,I'm happy that my husband is back into my life after 2 years of divorce, Dr.Davi brought my husband back today and i am so excited. I got Dr.Davi email online when a lady was testifying about the strong spell caster who restored her marriage then I said to myself since he helped her, he can also help me,so i emailed him and told him the pain that I was going through,and he told me what to do and i did it,Then he did an urgent Love spell for me. 48 hours later, my husband came back home and with lots of love and joy,and he apologised for his mistake,and for the pain he caused me. Then from that day,our marriage was now stronger than how it were before, All thanks to Dr.Davi. Our family is complete again. If you are going through Divorce/Broke-up since Dr.Davi helped me, he can also help you..email him at: Spelltemple@fastmail.com,Thank you Dr Davi for saving my broken Marriage and brought my husband back to me. Save Your Relationship and Get Your Ex Boyfriend/Girlfriend Back!contact: puritylovespell@gmail.com is certainly the best spell caster online and his result is 100% guarantee. My Name Jessica Jack form Tx,USA. After 12years of marriage, me and my husband has been into one quarrel or the other until he finally left me and moved to California to be with another woman. I felt my life was over and my kids thought they would never see their father again. i tried to be strong just for the kids but i could not control the pains that torments my heart, my heart was filled with sorrows and pains because i was really in love with my husband. Every day and night i think of him and always wish he would come back to me, I was really upset and i needed help, so i searched for help online and I came across a website that suggested that Dr Purity can help get ex back fast. So, I felt I should give him a try. I contacted him and he told me what to do and i did it then he did a Love spell for me. 28 hours later, my husband really called me and told me that he miss me and the kids so much, So Amazing!! So that was how he came back that same day,with lots of love and joy,and he apologized for his mistake,and for the pain he caused me and the kids. Then from that day,our Marriage was now stronger than how it were before, All thanks to Dr purity. he is so powerful and i decided to share my story on the internet that Dr.Unity real and powerful spell caster who i will always pray to live long to help his children in the time of trouble, if you are here and you need your Ex back or your husband moved to another woman, do not cry anymore, contact this powerful spell caster now. Here’s his contact:Email him at: puritylovespell@gmail.com ,or Call/Whats App him on:+2348070980389.